As the year comes to a close, we tend to look back with affection on all the great gaming experiences we had - but I don't want to do that right now. Instead, I'd rather take a look at two big, fat failures: one that will be remembered more for the meltdown of its development team than for its actual gameplay, and one that likely won't be remembered at all. Though neither game did gangbuster sales, they were important for a very specific reason. Any game can fail by simply being boring, or poorly made, or uninspired, but these two games failed trying to be spectacular, fresh, and new. If L.A. Noire had been a bold experiment, it might have succeeded, but it was actually several bold experiments fighting for dominance. The result was a snooze of a gumshoe sim with some gobsmacking tech running it. The facial animation was so good that it was actually distracting at times. I'd be so caught up in trying to remember where I'd seen the actor portraying whatever witness I was interrogating that I'd forget to listen to his statement. (By the way, the answer is nearly always Mad Men.) 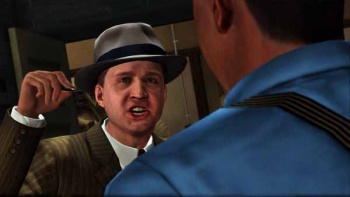 L.A. Noire, more than any other game before it, gave us hope that the uncanny valley might someday be conquered, and we'd finally be able to relate to our onscreen companions as though they were people, not merely peoplesque amalgamations of Botox and rubber. L.A. Noire's investigation mechanics were also quite innovative, though not every player appreciated their particular kind of realism. If you incorrectly accused a suspect of lying, or were gullible enough to fall for their line of BS, areas of investigation might forever be closed off to you - just like in real life. Detective games typically err on the side of giving people the short term memory of a goldfish, allowing you to grill them over and over until you figure out the correct line of questioning. But knowing that all you have to do is run down every conversation option and you'll eventually strike paydirt removes the actual detecting from most detective games, so I was glad that L.A. Noire wanted you to consider your responses carefully before confronting anyone. Unfortunately, the game's inconsistent logic fell into the same trap of so many other detective procedurals, leaving you frustrated that you couldn't confront the criminal that you knew was guilty, simply because you hadn't performed some action that the game considered vital. Investigating cases became exercises in frustration as you were forced into lines of questioning you knew didn't make sense. As much as I appreciated what L.A. Noire was trying to do, I didn't actually enjoy it, so one day I stopped playing and never touched it again. Rise of Nightmares is a first-person perspective survival horror game made exclusively for Kinect, and takes full advantage of Microsoft's motion controller. The controls are a mix of artificial and intuitive commands; putting your foot forward will send you walking down the hall, but to get rid of bugs crawling up your avatar's torso, you just brush yourself the way you would in real life. There's plenty of combat against gruesome monsters - the victims of your captor's cruel experiments - and that plays out pretty fluidly, too, as you slash or bash the way you would if it were really happening. (Though presumably with less girly screaming.) It's a great concept that was pretty much doomed to failure from the beginning. For horror to work, you have to completely give yourself over to whatever absurd premise you're being asked to swallow. An unkillable psycho in a Captain Kirk mask obsessed with offing babysitters? Sure, ok. A town apparently cut off from reality, shrouded in fog, jumping between realities and full of faceless nurses? Totally; why not? If you can't completely immerse yourself in the fiction, you can't really let yourself be scared by whatever boogeyman is being pointed at you, because some part of you knows that you're still safe and sound in the reality of your living room. You may be trapped in a spooky castle, chock full of shambling corpses with knives for arms, but the controls of Rise of Nightmares prevent you from ever really feeling like you're in any kind of danger. The fighting can get quite frenetic as you thrash and stab and kick at your opponents, but simply walking down the hall takes so much concentration that you're never unaware of the fact that you're controlling a videogame. The moments of immersion are constantly being hamstrung by your need to think about how to cross the room, pick up the shiv, or turn left. Rise of Nightmares never really gained the kind of spooky momentum a good survival horror title needs, but it should be admired for trying to bring something to the Kinect library other than yet another dance competition or collection of half-assed minigames. Both L.A. Noire and Rise of Nightmares failed but at least they tried. We don't applaud that kind of decision nearly enough. They failed, but they failed spectacularly, in ways that we hadn't seen before. So thank you, L.A. Noire and Rise of Nightmares, for daring to fail.